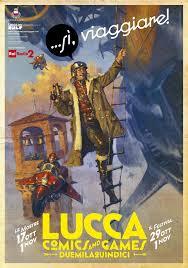 The greatest comics and games festival in Europe (in Lucca!) was blessed this year by wall-to-wall sunshine and the opening up of new spaces which gave this real-fun event a more spread-out and less crowded feeling. I’ve already described how the festival started out from a negligible event in a sports hall back in 1966 to become the international fixture it’s now, in my post at https://longoio.wordpress.com/2013/11/03/a-question-of-style/. This year the theme of the festival was ‘sì, viaggiare’ – yes, travel – both with conventional transport and with one’s mind, I presume! We arrived at just before midday to immerse ourselves in the contemporary make-believe of this mediaeval fantasy city. Sandra came dressed as ‘Spider cat’. If you haven’t come across a spider cat don’t be surprised: it’s a new creation courtesy of Sandra’s fertile imagination. The idea came to her not only from Spiderman but also from Italian ‘Topo ragno’ which translates as ‘spider mouse’ but which in fact refers to the shrew, so belittled by Shakespeare et al. The main characteristics of a spider cat are its ability to combine the best features of cats – intelligence, ability to have more than one life, craftiness and an affectionate nature – and of spiders – ability to move quickly, fine craft in making webs, capacity to see many things at the same time and complete disregard of gravity. I came dressed as a descendant of Genghis Khan, thanks to my trip to Outer Mongolia in 2008. Our outfits proved a not negligible draw and, if we’d asked for royalties for photographs that were taken of us we’ve be rather well-off by now! 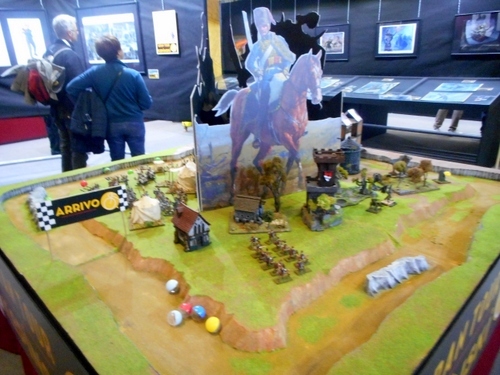 Lucca comics and games is, of course, a brilliant people-watching event and costumes were very varied indeed ranging from children’s fables to science fiction characters and from Japanese manga to western classic tales. The stalls selling everything from collectors’ item comics to the latest video-games were incredibly extensive and, also very well-attended! What were our highlights? First, the weather, principally because last time we were at the festival in 2013 it was a miserably drizzling day. Second, the people and participants who were, as ever, courteous and bent on having good clean fun. Third, the special events. We selected a manga drawing class in the Japanese village in the new gardens opened behind the beautifully converted monastery of Saint Francis (see our post at https://longoio.wordpress.com/2013/07/07/magisterial-monastery/ when we were present at its inauguration). Our teacher, who runs courses in the Academy of Manga art, was excellent and even enabled me not only to reach the correct proportions in drawing humans but also introduced us to drawing characters in action. There were lessons in Japanese, quiz shows and much else. I realise we’d barely scratched the surface of this event but better to select a few things well than many just superficially! There were several exhibitions of Japanese photography and paintings. 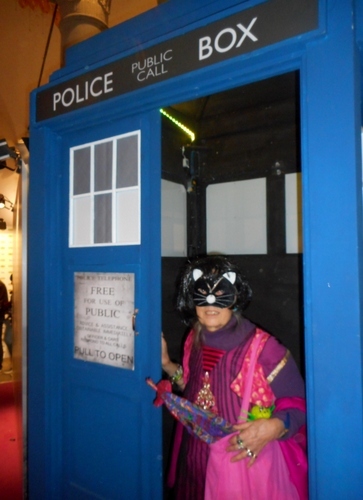 Among other areas there was even an opportunity to enter the Tardis! The exhibition highlights, as usual, were in the imposing Palazzo Ducale facing Piazza Napoleone where three very interesting displays were on show. The first presented the work of the French artist Bonvi and his comic strips based on a somewhat politically uncorrect Nazi soldier during the last conflict. It was a French slant on something that became the essence of that long-running British sitcom ‘Allo, ‘allo. The second exhibition was more serious and displayed the work of Emmanuele Luzzati with the theme of Jewishness in faery tales. The depictions of Jewish festivals were particularly poignant and the 3-D cut-out drawings were most effective. At this stage darkness had descended upon the fun and games at Lucca’s big annual event and, at the end of a long day, our legs were beginning to feel it. After a delicious cassata at that fabulous ice-cream shop in piazza Cittadella (the piazza in which the house where Puccini was born is situated) we wended our way to our car which, thanks to the clever intrigues of immigrant parking bay finders, we’d managed to park amazingly near one of the city gates. 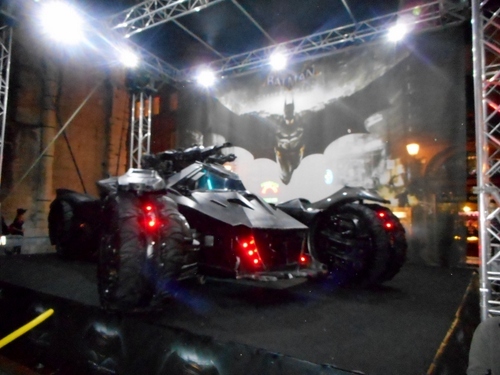 So ended yet another totally memorable Lucca Comics and Games for this year. See you there next year? Autumn colours have finally begun to splash our Val di Lima landscape. Here are some leaves (and mists) on the way to San Cassiano yesterday. Last night we’ve also had thunderstorms and, again, parts of Tuscany, especially the coastal areas, are suffering from the notorious and ever-increasing water bombs with widespread flooding and landslides. 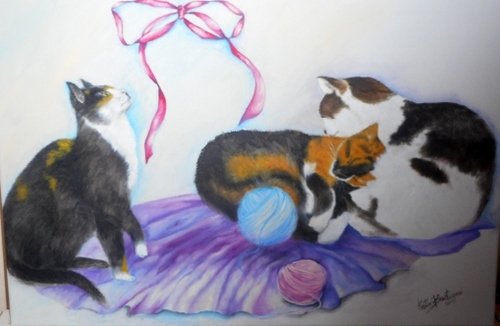 Mentioning colours, I took a look yesterday at the painting our highly talented artist Kety Bastiani from San Cassiano is doing of our cats, Napoleone, Carlotta and Cheekie. I couldn’t take it home yet as the paint’s still drying. I am so pleased with it. Kety has captured our cats’ colouring really well. She had free rein with the composition and the theme of our pets playing with a ribbon gives a fine sense of feline movement to the picture. It’s a truly delightful creation. If a picture is worth a thousand words, then a painting is worth a thousand photographs! A local neighbour told me the very sad news. 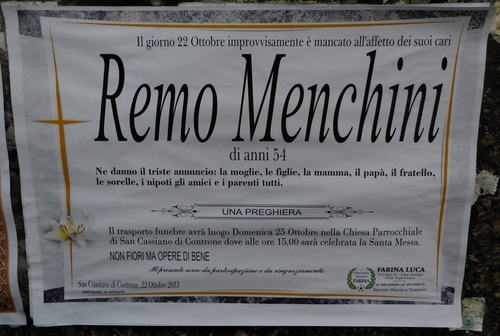 At the age of 54, Remo Menchini from our nearby village of San Cassiano committed suicide last week. He’d gone into the bathroom of his house and fired a bullet into his head. Another friend said to me ‘he could have chosen to go into the forest to do it!’ I only knew Remo slightly but he seemed to me to be a very personable and, indeed, positive person. It’s so terrible – Remo leaves a wife (who was the first one to discover her dead husband) and four daughters..
Remo’s funeral was last Sunday at 3 pm in San Cassiano’s beautiful parish church. 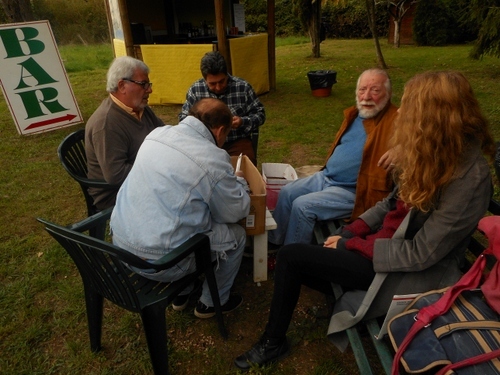 I did not attend – I’d already promised to be a helper at Ponte a Serraglio’s chestnut festival and, besides, I’m not particularly one for funerals. All the same, it must be said that a considerable number of people who would have attended the festival were at San Cassiano. Remo Menchini worked in the area of care and maintenance of the countryside including parks and gardens. 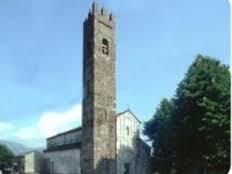 His firm was on the Via del Brennero at Bagni di Lucca. What immediately strikes me about the terrible act R did to himself is that I thought that suicide was something much more frequent in northern climes where the relative absence of sunshine, decent wine and greater sociability all impinge on emphasizing a sense of individual isolation. Perhaps I should re-examine the statistics. In my area I know of three other suicides, two of people I knew rather well. I’ve already described the suicide of the desperate young woman who threw herself off the spectacular Vergai bridge in my post at https://longoio2.wordpress.com/2015/01/13/a-suicide-and-a-miracle-at-corfino/. When teaching English at the Istituto Comprensivo of Gallicano, in one of my classes there was an extrovert and very amiable student, Sergio Fini, who presented me with a beautiful book of poems he’d written and with illustrations of magical trees that he’d drawn. Just two years later in Fornaci di Barga I passed by a black-bordered poster which stated that Sergio’s family thanked all those who’d sent condolences or attended his the funeral. I just couldn’t believe it! Again, there was nothing to herald the self-immolation of this incredibly talented and seemingly happy family man who left a grieving wife and two young children. I just found it so difficult to believe that someone who seemed so much at peace with himself, who worked successfully with special needs pupils and who was deeply versed in oriental philosophy and yoga, could have hung himself – at home! For some years we would have a brilliant pizza at Libra’s in Chiffenti – that is until Libra himself was found lifessly hanging in his own restaurant. Again, totally unbelievable. San Cassiano’s (and Lucca’s) most promising young organist was then a pizzaiolo at Libra’s restaurant and earned enough money to perfect his divine art at the Vatican City’s conservatoire and our evenings there in the company of friends were truly memorable. Later, when delivering English language courses at a well-known paint factory I re-met Libra’s daughter who was receptionist there and became one of my students. She’d seemingly made the greatest effort to come to terms with the family tragedy – even mystery, for Libra had been involved in some shady dealings with eastern Europeans and, just one day before being found dangling at the end of a rope, he’d gone to the local hospital because they’d jumped him. (Nothing, however, was found to incriminate them). One of the most lamented suicides was that of my schoolmate and university friend Ian McCormick (pen name McDonald) in 2003. He was perhaps one of the most brilliant writers on music I’ve ever read, Ian’s range was amazing – from his seminal book on Shostakovich to his definitive survey of the Beatles songs. Yet, just after the critical success of his last book of essays on British pop icons (he’d been in a band too) Ian was found gassed in his kitchen with a sign on the front door stating ‘please call the police’. Depression, Churchill’s black dog, is surely largely to blame for all these mournful situations – exacerbated, of course, by money and emotional problems. It just doesn’t matter whether you live in a beautiful earthly paradise surrounded by green hills and in close touch with miraculous nature (like where I live) or within an inner city tower block in a drug-infested housing estate, the black dog makes no distinctions. 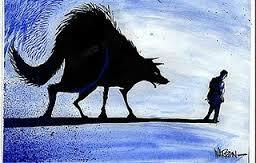 It chooses its victims with equal disregard for their loved ones and their friends. May the ghastly animal never bite me, not even on Friday the thirteenth! The official theatre season at Bagni di Lucca’s Teatro Accademico hasn’t yet begun yet there’s plenty happening in it. Last week-end there were two shows both by amateur companies but which showed an almost professional grasp of their craft. On Saturday there was a homage to Eduardo de Filippo, the great playwright from Naples who restored the dialect of his city to the artistic heights it deserved. The homage consisted of collages of scenes from two of his comedies, Uomo e galantuomo and Sik-Sik l’artefice magico, interspersed with songs and poems, again by De Filippo. Neapolitan is in many respects a separate language from Italian and not merely a dialect. However, after some initial baffling minutes it became easier to understand, certainly a lot easier than Glaswegian is to a Londoner! One of the pieces involved a somewhat unconventional company of players who upset the rules in the hotel where they are staying with hilarious results. The songs were beautifully sung too. The Altroteatro association, which put on the production, is directed by Antonello Nave and was formed in Florence in 1999. I was first introduced to the colourful theatre of De Filippo several years ago (in 1977 to be exact) when a production of his ‘Filomena Marturana’ was put on in at London’s Lyric theatre. I was privileged to assist at the rehearsals held in the Italian Institute. Among the actors were Joan Plowright and Colin Blakely but what was even more exceptional was that Franco Zeffirelli was there to direct. I shall never forget that memorable occasion! On Sunday we were treated to the Compagnia Vitamina Dance’s production of “Oh Mamma! Che Musical!” directed by Fabrizio Magnani. I had suspicions that this was an Italian version of the musical ‘Mamma Mia’ based on Abba’s songs and I was pleasurably right. Although not all the singing was of the highest calibre the togetherness of the ensemble and the sheer joy of the choreography thrilled the audience until, at the end, the company was treated to a standing ovation. Abba is a group that has overcome any former ‘euro trash’ sneering at it. The group’s songs remain highly memorable and beautifully constructed. It’s no wonder that Abba’s music has sold more copies than any other pop group, apart from the Beatles! 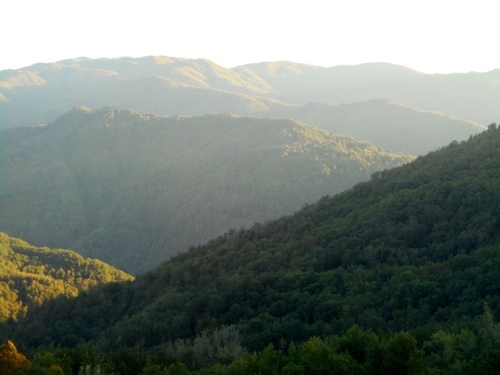 It’s quite pointless for some kill-joys to declare that nothing happens in Bagni di Lucca. There’s quite a bit happening and one has only to keep oneself informed by picking up leaflets at the tourist office (when it’s open), by trawling the internet, or by looking at the posters in the bars. The fact that our theatre was largely empty on Saturday and just over half-filled on Sunday was a reflection of the apathy of too many people here rather than a reflection on the standard of the shows offered which was exceptionally high and would have done honour even to a professional company. Don’t miss therefore the frantically funny Feydeau farce, coming up next at your local Bagni di Lucca theatre this Sunday, November 1st, at 5.30 pm. It’s getting to the end of October and still the countryside’s colour is predominantly green. Yesterday we went for our usual cat-walk in the environs of our village of Longoio. 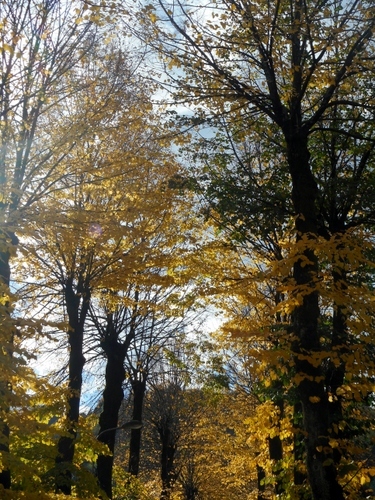 There were only tinges of gold, reds and yellows appearing in the foliage. I’m quite sure that ten years ago, when I first landed in this part of the world, colours were more autumnal at this time. Speaking to people that have been here all their live it’s quite clear that climate change in the last decade has accelerated at an alarming rate. Our hopes don’t quite lie with the proles, as Orwell stated in his ‘1984’, but with our youth. Recycling, ecology, environment these are words that weren’t quite emphasised enough when I attended primary school. I’m certain they are now! Anyway, two of our cats, Napoleon and Cheekie, had a good time in the forest (Carlotta stayed at home) and I’m sure there’ll be plenty more walks like this. When the real autumnal colours spread in our forests I’ll let you know! 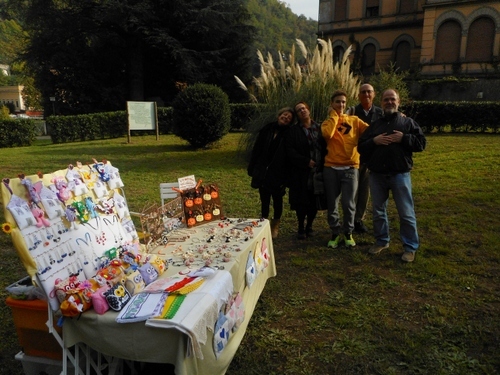 This year’s chestnut festa organized by the indomitable Morena and her Borgo degli artisti association in the gardens of Villa Fiori, Ponte a Serraglio, postponed from last week because of inclement weather, was very well attended yesterday. All the fixtures we are used to were there. The chestnut roaster, which provided a great example of how to recycle dismantled washing machine parts. 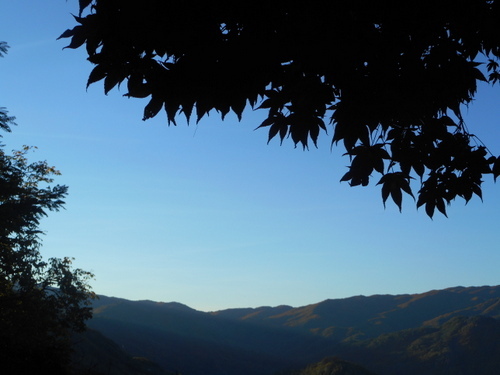 The Tre Potenze association, which aims at regenerating people’s local roots with this mountain area and organizes the Festa della Montagna outside Montefegatesi, put on a fine display of items from traditional contadino (peasant) life. I was roped in to ‘prick’ chestnuts. This is necessary otherwise they’ll explode in the roaster because of expanding air within their hard shells. Congratulations to all those concerned in ensuring that this traditional event continues to attract people from all corners of our comune and beyond! Mix ingredients into a smooth batter. Cook in a non-stick frying pan like a pancake. Grease pan with olive oil for each Necci. It’s also possible to grease the frying pan with a potato dipped in olive oil. (It is, of course, preferable to use a cast-iron griddle over a gas fire, as was done at our event). You can also have savoury necci if you fill them with pancetta (or bacon).